Winter Conditioning | Lake Braddock Crew | Stay Winter Fit! Stay Fit During Off-season with Winter Conditioning! 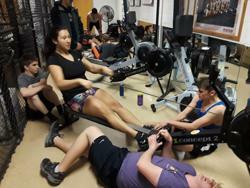 During an intense workout some fellow rowers helped hold down the erg! Winter Conditioning is a program run by the Lake Braddock Crew Team throughout the winter sports season. It’s meant to prepare the crew team for the spring rowing season, but all athletes are welcome! It’s a great opportunity for athletes that want to prepare for spring sports to stay fit and motivated. It’s an intense and fun experience designed to build strength and confidence in all participants. For new rowers (novice), winter conditioning is not mandatory but is highly encouraged. It is a great way to meet other perspective rowers and make new friends before the official season starts. If you’re interested in crew but still want to participate in another winter sport, that's fine, just let our coaches know you’re interested. During winter conditioning we teach you how to row on an erg! An erg is an on-land rowing machine that you can find at most gyms or training facilities. Erg rowing is a full body workout focusing on cardio and strength. The goal on the erg is to teach proper rowing technique and build the muscle needed to compete! Want to see more crew videos? Check out our YouTube page!